When you are on vacation and facing a busy day of sightseeing or active outdoor activities, you need a good breakfast to set you up for the day. 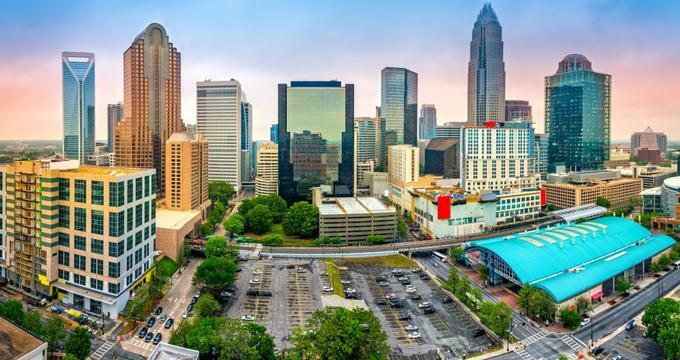 Charlotte offers a wide choice of restaurants and cafes serving up great American breakfast favorites, often with a distinct Southern flavor. 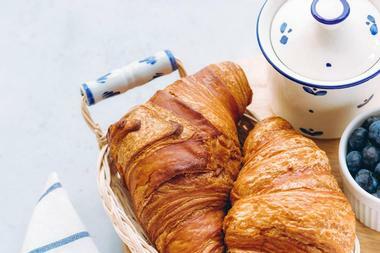 You will also find several French bakeries and creperies (a legacy of the French Huguenot immigrants of the 1600s), where you can enjoy a fabulous continental-style breakfast featuring delightful flaky croissants, crepes, and quiches. In recent years relaxed weekend brunches have become very popular and several regular city restaurants have come to the party with innovative Saturday and Sunday brunch menus, often including a signature cocktail to welcome the weekend. 300 East is a family-owned restaurant that has been pleasing palates in the greater Charlotte area for more than 25 years. Although 300 East does not have a daily breakfast service, they are a very popular venue for a relaxed and enjoyable Sunday brunch. The restaurant specializes in using fresh seasonal ingredients, most of which are locally sourced and responsibly farmed. You can look forward to innovative takes on most of the more popular breakfast specialties such as eggs Benedict as well as frittatas, breakfast pizza and breakfast burritos. Of course, regular bacon and egg dishes (including vegetarian options) along with a variety of tasty extras are also available. Bookings are advised. Situated in a beautifully renovated old church building complete with stained-glass windows and plenty of dramatic décor, 5 Church is primarily a modern and up-market lunch and dinner restaurant and bar. On the weekends, however, you can also visit to enjoy a delicious brunch menu that will more than keep you going until dinner time. You can look forward to slightly more substantial breakfast choices, including beef or lamb burgers, but all the traditional breakfast options are available, either served traditionally or with a distinct Southern twist. Vegetarian and gluten-free options are available, and you can add a glass or two of chilled bubbly to make it really special. You can treat your taste buds to an authentic taste of France at one of four Amélie’s French Bakery and Cafés in the Charlotte area. Each of the venues offers mouthwatering French breakfast favorites, such as golden, flaky croissants (with or without chocolate and almonds), rich and satisfying classic quiches as well as your choice of breakfast sandwich with the works. 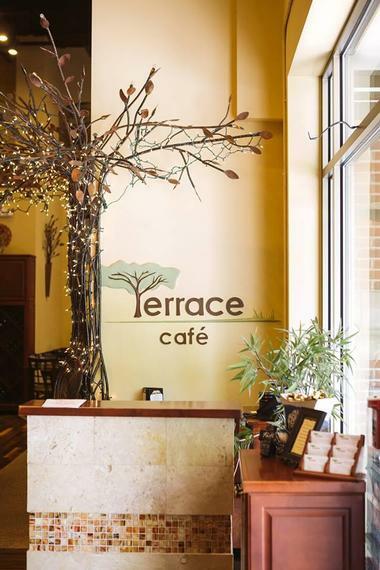 In addition, the café serves many other sweet treats, such as muffins, sticky buns, and apple turnovers, all of which perfectly pair with a cup of freshly brewed French or Italian-style coffee or a selection of teas. Each of the venues features its own style of up-market French-influenced décor to make you feel at home. 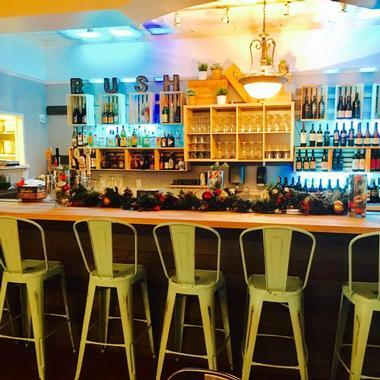 Proudly featuring in the 2017 list of Top 10 Charlotte Brunch Venues, Bistro la Bon is gaining a reputation as a popular Saturday and Sunday brunch destination in the heart of Plaza Midwood. If you visit on a Saturday, you can choose from all the usual breakfast/brunch egg dishes as well as slightly more hearty fare such as a breakfast burger or Swedish pyttipanna (a filling “hash” with brisket, potatoes and egg) or sample the NC Shrimp and Grits, one of the venue’s most popular offerings. On Sundays the bistro serves a brunch buffet that offers eggs to order and a wide choice of accompaniments. 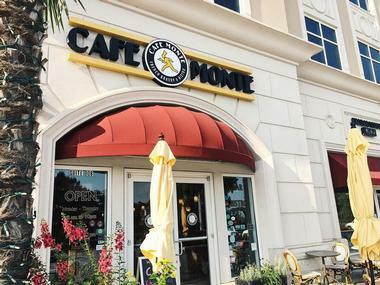 Serving fresh farm-to-fork ingredients prepared with French flair, Café Monte is an ideal breakfast or brunch venue. The restaurant is primarily a French bakery and bistro where you can choose to have a simple continental-style breakfast of freshly ground coffee accompanied by a delicious pastry or order something a little more substantial to last you through till dinner. A few of the mouthwatering dishes on offer include a variety of burgers, baguettes, and croissants, several egg and omelet variations as well as a choice of crepes, waffles, and quiches. Gluten-free options are available and health nuts can order fresh fruit and yoghurt or a healthy granola parfait. 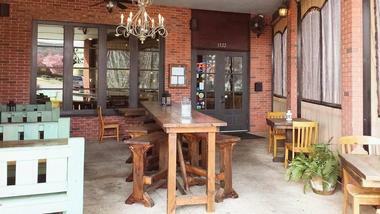 Café South is a family-operated restaurant that is conveniently situated just off the I77 in Charlotte. You need to bring a big appetite with you to Café South – the restaurant offers a really extensive breakfast menu featuring all the regular breakfast favorites as well as an impressive list of add-ons so that you can fully customize your meal. You can start with your choice of eggs cooked just the way you like them, and then select anything from ham to rib-eye steak or pork chops to build your personal favorite breakfast dish or choose from one of the popular menu combos. The griddle menu features French toast, pancakes, and waffles served with your choice of delicious toppings. Crispy Crepe is your go-to restaurant in historic downtown Charlotte when only a crepe will do for breakfast. The restaurant offers a great selection of light and crispy crepes that can be dressed up with either sweet or savory toppings to make a perfect French-style breakfast. If you have a sweet tooth, you can settle for a traditional cinnamon roll crepe or pull out all the stoppers and order a chocolate and peanut butter or Nutella and fruit filling. Savory options include bacon and egg, smoked salmon, and chipotle chicken, among others. You can also order a gluten-free or organic buckwheat option. Crispy Crepe also serves a more traditional American egg and bacon breakfast as well as caramelized waffles. Eddie’s Place Restaurant has been serving up great Cajun-influenced classic American breakfasts, lunches, and dinners for over ten years. The restaurant is located in the Southpark/Cotswold area of Charlotte and provides both visitors and regulars with great food served in a warm and inviting environment. At Eddie’s you can have breakfast at any time of the day and popular choices include omelets, pancakes, waffles, and burritos, all of which can be customized according to your tastes. You could also order a country fried breakfast, steak and eggs or traditional eggs Benedict. Team any of the above with a great cup of coffee and you’re set for the day. 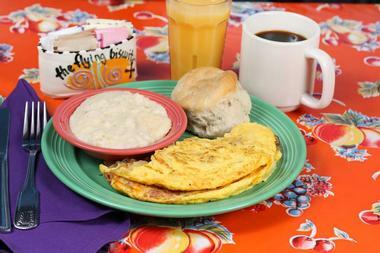 The Flying Biscuit Café franchise started with a single outlet in Atlanta in 1993 and such was the success of that original restaurant that the chain has grown to 14 separate locations throughout North Carolina, Florida, and Georgia. The secret of their success has been their signature biscuit and their Southern-inspired menu, which features freshly prepared comfort food. 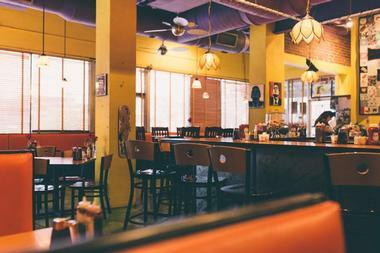 You can try their very popular creamy grits and biscuits at any time of the day together with a host of mouthwatering other dishes such as omelets, egg or tofu scramble, or Southern-influenced Benedict – poached eggs and turkey bacon served on a soft fluffy flying biscuit and draped with hollandaise and basil. If you plan to visit George’s Brasserie in SouthPark for their popular Sunday brunch, you need to bring along a big appetite. Offering a great combination of breakfast and lunch dishes, a Sunday brunch at George’s will easily keep you satisfied till dinner. You can go the traditional breakfast route and select eggs cooked to order or opt to try the prime rib carving station and accompanying side dishes or start at one end and work your way through to the other. The brunch buffet includes oysters, shrimp, and clams as well as delicious pastries and desserts and Champagne is on special. The Sunday brunch buffet is served from 10.30am to 2.30pm. When you are in the mood for a delicious breakfast crepe you can choose from one of three branches of Hazelnuts Creperie dotted around Charlotte. The restaurants serve up wonderful flavor combinations featuring many old favorites alongside some unusual taste bud tingling blends. The creperies offer a list of particularly breakfast-suitable crepes featuring ingredients such as various combinations of eggs, cheese, and bacon, or you can opt to order your breakfast from their savory, sweet, or vegetarian menu. Don’t worry if you have gluten intolerance – gluten-free crepes are available and there are even special kids’ crepes on the menu. If you are in a rush or need a large number of delicious crepes, you can order online and pick up your feast at one of the venues. 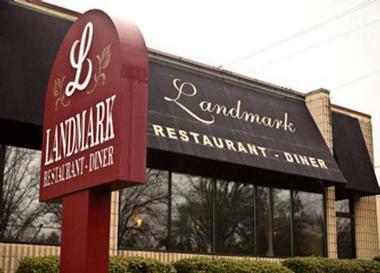 No matter what time of day (or night, for that matter) you might feel like breakfast, you will find a terrific choice of breakfast staples at the Landmark Restaurant Diner. The diner is a comfortable and family-friendly restaurant that boasts a very extensive selection of meals, including everything your heart could possibly desire for an any-time breakfast. Their menu features everything from healthy fresh fruit and yoghurt options to totally indulgent feasts including eggs, steak, cheese, biscuits, grits, and hash browns. 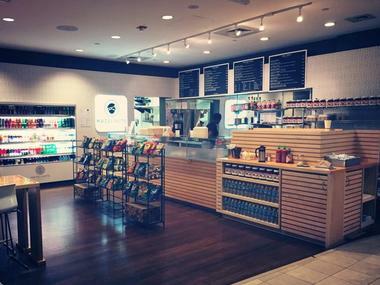 For something a little lighter you could choose something from the Bagel Bin or the Breakfast Bakery selection. 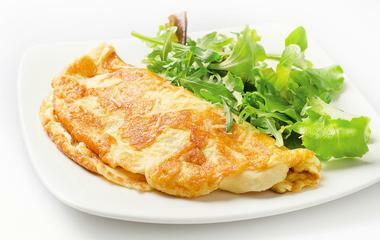 Pancakes, omelets, and great fry-ups are cooked to order just the way you like them. For over 25 years Charlotte locals have been coming to Le Peep Restaurant to enjoy their innovative take on breakfast (as well as lunch and dinner). The restaurant sets out to please palates by using fresh, local ingredients prepared to order and served with a smile. The breakfast menu is extensive, and you can build your own omelet, choose from one of the menu classics, order eggs cooked any way you like. or choose from one of their six Eggs benedict options. 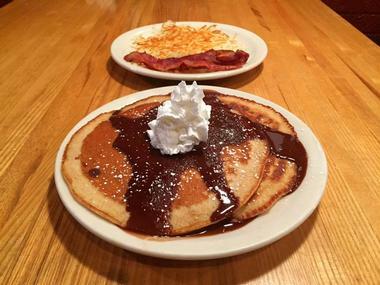 If you are not in the mood for eggs, you can try an Aspen fruit crepe, Dutch apple oatmeal, or a delicious bagel to get your day off to a good start. The Little Spoon Eatery is becoming a popular venue for laidback Sunday brunches served with a side order of hip-hop music. However, you can also pop in for breakfast any other day of the week with the exception of Monday, when the restaurant is closed. The Little Spoon’s menu changes regularly to showcase locally sourced seasonal produce and offers many regular and Asian-fusion versions of modern American dishes. Although the menu does feature regular bacon and egg dishes, many of the breakfast items would be equally at home on a lunch menu and provide a tasty and filling meal that will see you through to dinner time. 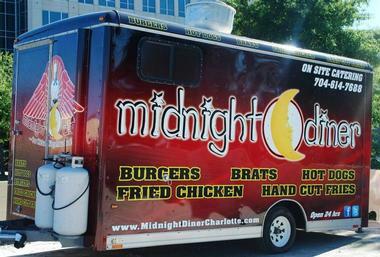 Don’t let the name of this family-friendly diner fool you – the Midnight Diner is open for business 24 hours a day, which means that you can choose to have breakfast there at any time of day or night. The diner has a very extensive menu for both breakfast and other meals. and you can choose any combination of eggs and sides to tailor-make your favorite breakfast feast. If you are on a health kick, you can order basics like cereal and fresh fruit, and if you have a sweet tooth, the Coconut Crunch French Toast or the Pecan Belgian Waffle could be just what you need to start your day. Pressley Park Restaurant has been pleasing Charlotte palates for over 30 years and has received several accolades for its, breakfasts, service, and modest prices. You can expect to find all your favorite breakfast dishes on the menu and there is a different breakfast special every day. Some of the most popular choices include biscuits (served with your choice of side), several delicious made-to-order omelet and pancake combinations as well as sandwiches and the famous Grilled Pork Chop Special. 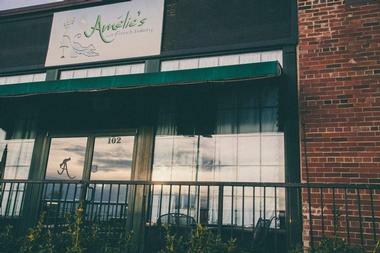 Wash it all down with their award-winning tea (voted best tea in Charlotte) or a cup of freshly brewed coffee. 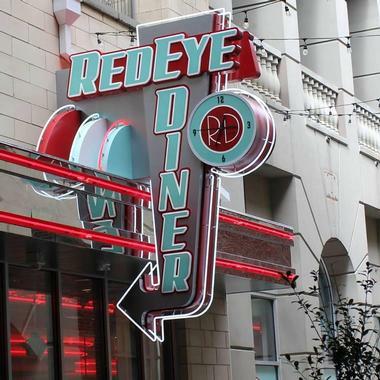 Whether you are an early bird or a dedicated night owl, the RedEye Diner can serve up the breakfast of your choice 24 hours a day. The diner serves up farm-fresh AA grade eggs cooked just the way you like them, accompanied by your choice of sides. There are several mouth-watering omelets to choose from, all served with grits, hash browns, toast, biscuit, or fresh fruit. If you need something a little lighter, you can select French toast, waffles, or buttermilk pancakes with your choice of toppings. The diner also offers a children’s menu and serves up freshly brewed 100% Colombian coffee. 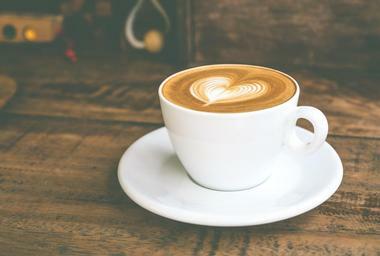 Besides providing a much-needed morning shot of caffeine to get you going, Rush Espresso Café and Wine Bar’s three Charlotte venues are also the ideal place to go for a delicious breakfast. If you just want something light and healthy, you can grab a delicious Bircher muesli or bowl of oatmeal or try a seasonal fruit cup or yoghurt and granola parfait. If you love a traditional cooked American breakfast, you will find all your favorites on the menu, including eggs Benedict, breakfast burgers, croissants, and paninis, all served with a choice of optional side dishes. 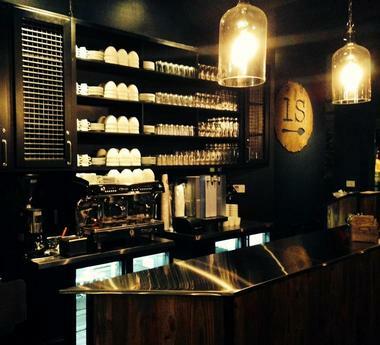 Gluten-free bread and pancakes are available, and the coffee is legendary. 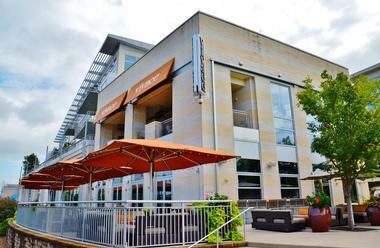 With outlets in SouthPark, Ballantyne and Fort Mill, Stuart Penick’s Terrace restaurants are an ideal choice for a tasty breakfast, featuring traditional Southern cuisine with an innovative modern twist. If you are looking for a traditional cooked breakfast, you have come to the right place; you can build your own omelet, feast on shrimp and grits or enjoy a tasty Eggs benedict. Sweeter specialties include a lemon poppy seed French toast served with fresh berries, fluffy buttermilk pancakes with fresh berries, or a decadent red velvet waffle. The restaurants all have a relaxing ambiance and offer a reward program for frequent diners. The up-market Asbury Restaurant in the Dunhill Hotel is a great place to enjoy a truly delicious Saturday or Sunday brunch. The restaurant places great emphasis in crafting fresh Carolinian food with a distinct Southern influence, using locally sourced ingredients from trusted suppliers. The brunch menu features breakfast platters (which can be shared and include vegetarian options), perennial favorites like chicken and waffle and Southern Benedict as well as a large selection of side dishes so that you can customize your meal. On a lighter note, you can enjoy an oatmeal bowl with delightful toppings or a hummus bowl with savory toppings. Wash it all down with a glass of bubbly or a classic mimosa. 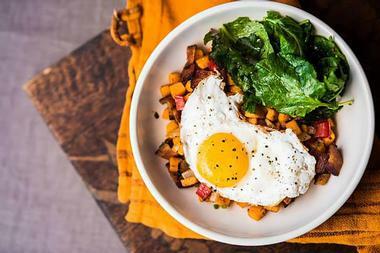 If you are looking for Southern-style comfort food, you will find lashings of it at the Tupelo Honey Café Brunch, served all day long on Saturdays and Sundays. The extensive brunch menu starts off with snacks and sharing platters before moving on to various greens served with grilled or Southern fried chicken, a variety of sandwiches and burgers, and all your favorite breakfast egg dishes, many of which are enlivened with a great Southern twist. In addition, you can further tailor your meal by adding a few side dishes like sliced avocado, chorizo, or mac and cheese. Round off your meal with a signature Tupelo Honey Mimosa. Vivace is a trendy Italian restaurant situated in a modern building with a great covered terrace – the perfect spot to enjoy a relaxed Saturday or Sunday brunch with an Italian twist. The restaurant offers a fixed-price brunch deal that includes a starter, a cocktail, and a main course. Starters include things like calamari, mussels, meat balls, salads, and soups. For mains you can chose from delicious Italian versions of classic American breakfast dishes, such as Benedicto Vivace (eggs Benedict with mortadella) or shrimp and grits featuring Parmesan polenta and prosciutto. Desserts, side dishes, and add-ons are available at an extra cost. Zada Jane’s is a bright and arty café located in the heart of Plaza Midway, where it has been serving up breakfasts and lunches for over ten years. The restaurant offers a good mix of regular and vegetarian breakfasts, including many of your favorites. You can construct your own omelet, enjoy hash browns served with happy eggs and your choice of meat or vegetarian sides, or opt to savor a plate of fluffy buttermilk pancakes. Gluten-free options are available and strict vegetarians can rest assured that no meat is ever allowed on the veggie grill. 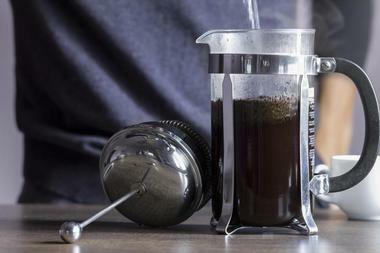 You can wash it all down with a variety of teas and coffees or juices and soft-drinks.